Happy one day after Easter! I hope you all enjoyed the short break in which we celebrated the resurrection of our Savior as Jesus conquered death and washed us forever pure and clean with his blood. I for one thoroughly enjoyed my short break which thankfully felt like an eternity, which was nice to enjoy the long days. I always miss spending time with my family while I am up at school so an extra weekend to go home was great! As is my method every year, Easter dress preparations start at least a month on advance for brainstorming and usually a few weeks out to actually make the dress. Thankfully I was able to make a slight dent in my sewing pile over spring break, and this 1960's sack dress was one of those projects. Like most of my dresses, this one is made from an old 1960's sheet. Oddly enough, I received the sheet about three years ago from a friend and just now got around to using it for a project. From the moment I first saw this sheet I immediately imagined making a 60's dress out of it and every vision in my mind came true when it was all said and done! 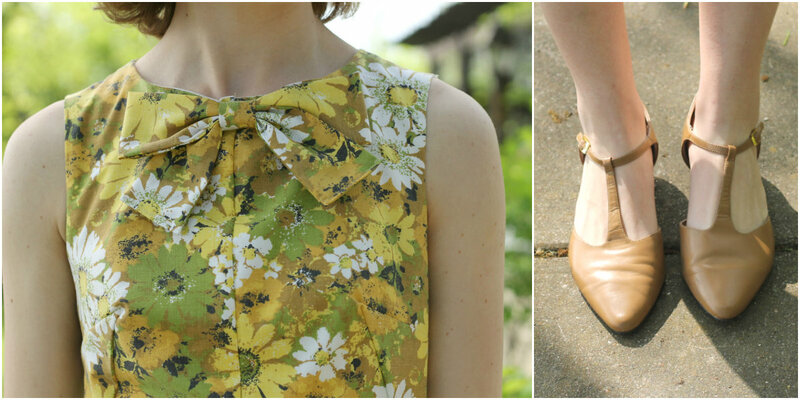 I have really been on a 1960's spree recently and this dress was the icing on the cake! 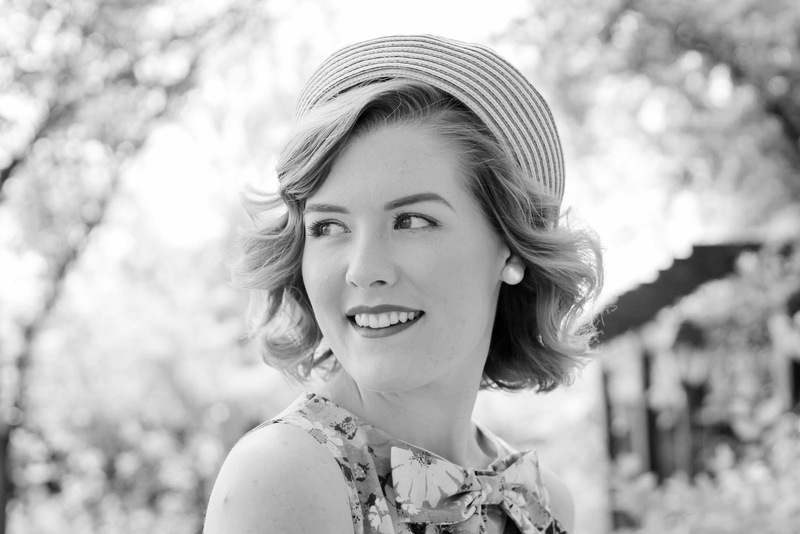 Of course, you cannot have a fabulous 1960's look let alone an Easter ensemble without having the perfect hat! Of course, this hat was a treasure I found probably 2 years ago and right when I got it I knew that I wanted to wear it with the dress I was planning on making from the sheet. Needless to say, this ensemble three years in the making but it was all worth it! 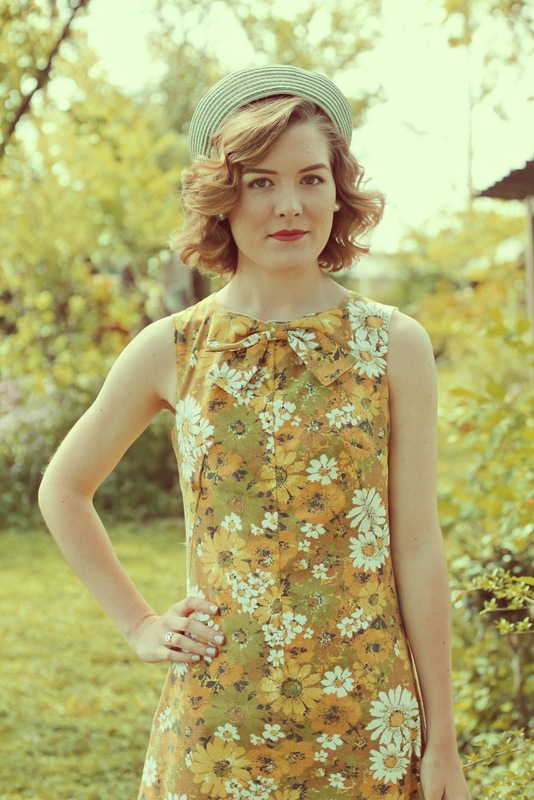 I have to admit that the 1960's seem to be my spring inspiration and I will most likely be making a few more dresses like this in the future. As every Easter is my time to pick a decade, dress up, and wear a fabulous Easter Bonnet this Easter was no different! The fact that my family goes to an old small town Church on Easter Sunday makes the thrill of wearing a vintage ensemble all the more rewarding as the ladies in the congregation grew up in the decades that I dress from and I love seeing their smiles as I walk into the Church, as if stepping from a different decade. One lady even even came up to me when we were greeting everyone and said "I admire you in wearing that hat, it looks lovely." What do you like to wear on Easter Sunday? Do you like wearing Easter Bonnets? THAT IS SO CUTE!!!! This year I did thee 'passion play' (I was an angel) twice. Your comments always make my day Charlotte:) I love your expressions too! Thanks a million! I have to agree that the cat is my favorite part! You look like a dream! I absolutely adore this ensemble, and the lipstick really tops it off. Thank you Abbey! The lipstick is my go to shade for the spring! Madison! You look marvelous! I love your sheet-it was perfect for that dress! I feel like you are ready to be cast in a movie! Happy Spring! OH thank you dear! (Love your user name btw...hehe). Thank you Sara! It is one of my new favorites! Ooh. I wouldn't normally say that I like the styles from the 60's but it is growing on me. You look great in it. This is such a lovely dress. I love the 60's, I think it suits you really well. These photos are stunning and full of spring! Hope you had a wonderful day celebrating our risen Savior! Oh my gosh...The Help...yes you are so right! This dress is SO ADORABLE! I just found your blog and I loooove it :) As a fellow thrifter/vintage lover/blogger - I am so glad I stumbled upon your blog! Hello, and welcome to my blog! So thrilled that you discovered my little corner of the world:) I hope you enjoy what you see and come back!! This outfit is so cute, I love your dress and the hat matches perfectly! You look really cute in this outfit,just love your print.You look stunning in this color.